The quilt artists from Gracanica, Kosovo. Samantha found her quilters through a long and roundabout route. She began by contacting Igo Rogova, from the Kosova Women’s Network, a long-time AP partner. 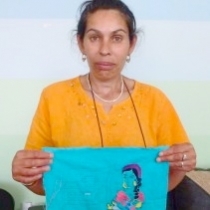 Igo sent her to a Kosovar organization that works specifically with Roma – the Network of Roma, Ashkali, and Egyptian Women’s Organizations of Kosovo (PROGRAEK) in Prishtina. 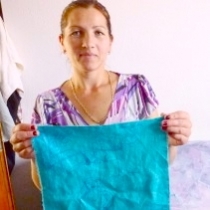 Shpresa, the coordinator of PROGRAEK, put Samantha in touch with two community groups – the Voice of Roma, which works from the village of Pleotce near Gracanica, and Iniciativa 6, an advocate for the rights of young Roma in the town of Prizren. 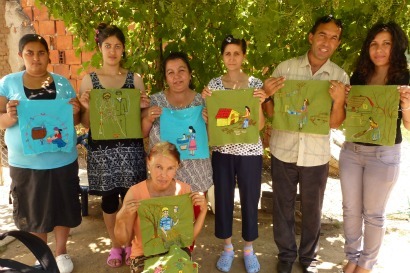 Helped by some formidable Roma networking, Samantha had finally her quilting partners. 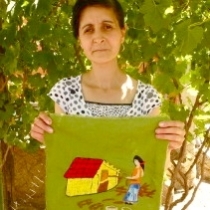 Hisen Gasnjani, the coordinator of Voice of Roma, organized the first of the two quilts from his home village of Pleotce. 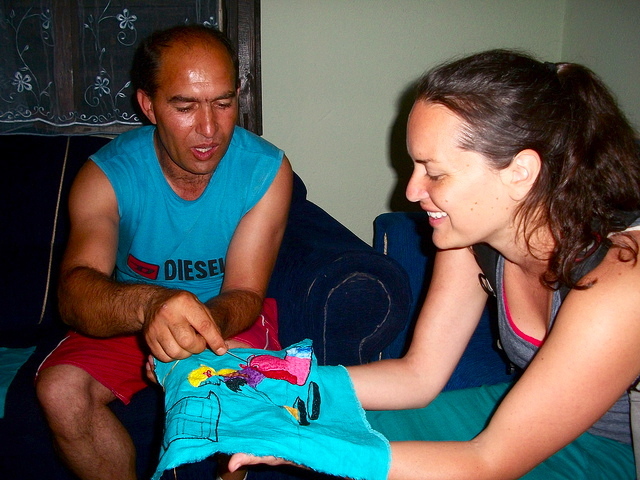 Hisen began by contacting two close friends, Farija Mehmeti (photo), a Roma artist, and Arsida Memeti, a seamstress. He then signed up four more friends who had no experience of embroidery or art but were anxious to learn. Farija the artist, then took over. 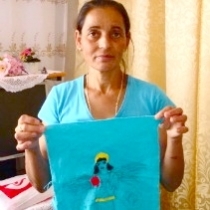 It was unusual to find a Roma artist, as Samantha noted in one of her blogs. Farija was the exception. Her water colors had been exhibited and sold. As a result, the others members of the group deferred to her, and she helped them to outline their designs. 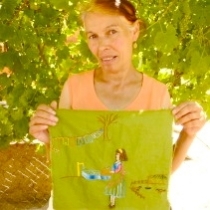 Farjia Mehmeti (right) a skilled local artist, helped other quilters design their squares for the Gracanica Roma Quilt. These bright designs also reflect the poverty of Roma life. 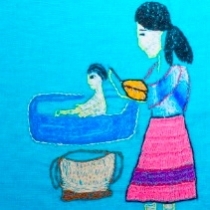 One design shows a mother conserving water by bathing her child in the same water used to wash dishes. Another shows a woman carrying a heavy load of firewood. The most poignant tile appears to depict a Roma wedding, which is central to Roma culture. Looked at more closely, it carries a stinging message. 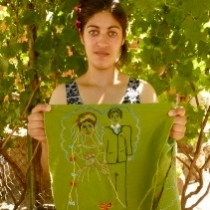 Adrijana, who is something of a Roma advocate, wanted to expose the tradition that calls for Roma brides to be virgins on their marriage night. AP Peace Fellow Samantha Hammer admires one of the finished squares with Hisen Gasnjani, program coordinator from Voice of Roma. Beti, Director of the Roma group Open Door, assembled the quilt. 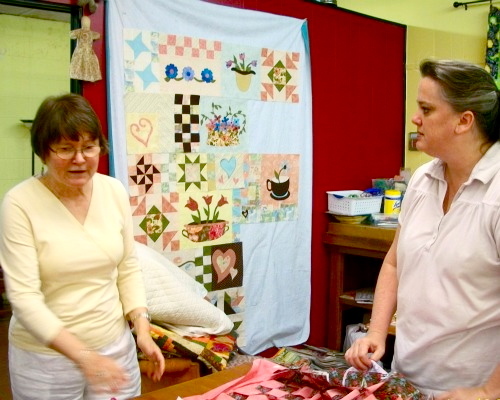 Quilters Bobbi (left) and Sharon assembled the panels into the Gracanica Roma Quilt. 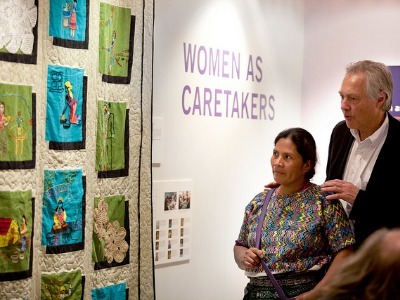 On Display at the UN: Isabel Osorio Chen, a survivor of massacres in Guatemala, was one of the many visitors who admired the Gracanica Quilt at the UN on March 8, 2012. 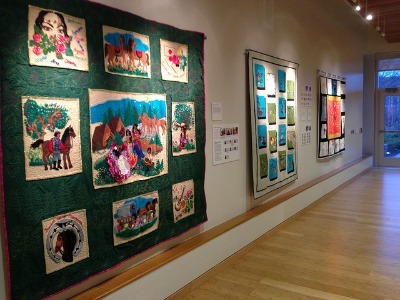 The Roma Quilts at Kean: the Gracanica Quilt hangs between the Roma Tajo quilt from Lithuania, and the Czech Roma Quilt. Djeljana chose to make a tentene pattern for her square. 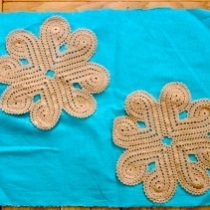 Tentene is a type of crocheting that many women from the region – Roma, Serb, and Albanian – use to make household decorations. Djeljana made her square without using a pattern, but many women get patterns from magazines and newspapers. Djeljana is currently in her last year of high school in Gracanica. She hopes to go to university next year and become an architect. 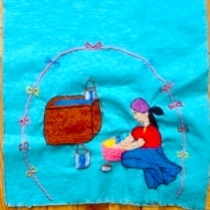 Senada’s embroidered panel shows a Roma woman washing clothes by hand and drying them on a line. Roma women still do laundry by hand in families that cannot afford modern washers and dryers and Roma women are often relegated to such household tasks in the Roma culture. Senada usually does tentene, which she learned from her mother-in-law, Fatima. She lives in the village of Livadje. 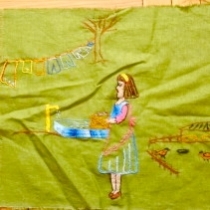 Anita’s square depicts a scene from before the time that Roma houses had running water, when women would wash dishes outside. This woman uses fresh well water. Anita added decorative touches, like the ribbon frame, to make the work scene livelier and more pleasant. Anita lives in the village of Preotce. 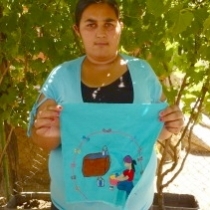 Andrijana, from Preotce, chose to embroider a scene showing an important aspect of Roma women’s lives – service. Andrijana’s panel shows a Roma woman serving coffee to a guest or family member. Hospitality is very important in Kosovo’s Roma culture – guests are always offered something to drink when they arrive. Roma women are expected to serve the needs of others before attending to their own. 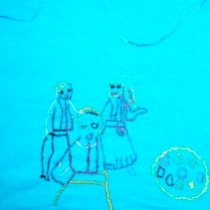 Andrijana chose to embroider a typical wedding scene for her second panel. Weddings are extremely important in Roma culture. Once she is married, a Roma woman is transferred from her father to her husband’s house, where, as the lowest-ranking person in the household, she must serve her new family. Many girls are in their teens when they get married, although attitudes to young marriage are slowly changing. Still, many traditions still surround Roma marriage in Kosovo. One requires that the new bride is a virgin before she is married. Roma weddings are typically large and elaborate, with much attention paid to the bride’s dress and jewelry. In some places, like Preotce, the groom pays to the girl’s family. Fatima lives in Livadje and is the mother-in-law of Senada. 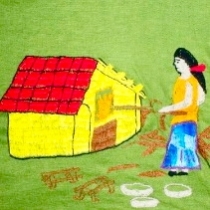 Her square shows a Roma woman gathering wood for cooking and heating, and carrying it home on her back. 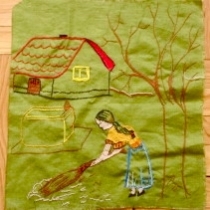 This arduous work fell to Roma women before Roma houses had electric heating and stoves. 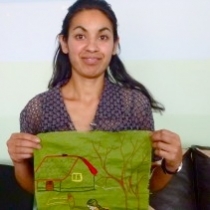 Fatima is skilled in different kinds of needlework – she spends much of her time making tentene designs, which she sells to supplement the family’s income. She lives in the village of Livadje. Fatima, 52, is from the village of Preotce. 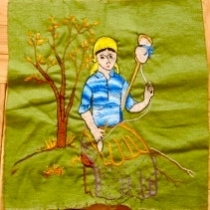 This panel shows a woman making thread with a traditional spindle. 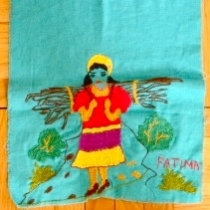 Fatima was interested to sue the quilt project to show traditional life for Roma women. She says that although their lives are still difficult, it was harder and more gruelling in the past. But Roma women must still ask for their husbands’ permission to do many things. 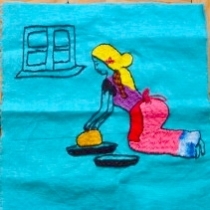 Fatima’s second panel shows a woman washing clothes. 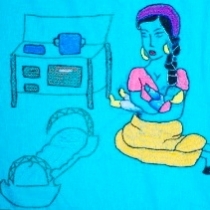 Arsida’s panel shows a married Roma woman preparing bread dough. Arsida wanted to include this scene because bread-baking is part of a Roma woman’s everyday life. But it’s also hard work. Arsida says that the domestic life of a married Roma woman is close to slavery. If she does not bake bread and complete her housework chores, the consequences can be serious. Farija, from the village of Lapinja outside Pristina, created most of the designs for the Pristina panels. 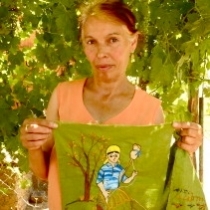 It is difficult for a Roma woman artist from a small village to make a living, but Farija is dedicated to her art and spends as much time as she can painting. Last year, Farija, 32, became the first Roma woman painter to be exhibited in Kosovo. She uses watercolor to create her vivid portraits and depict the cultural diversity among Kosovar Roma. 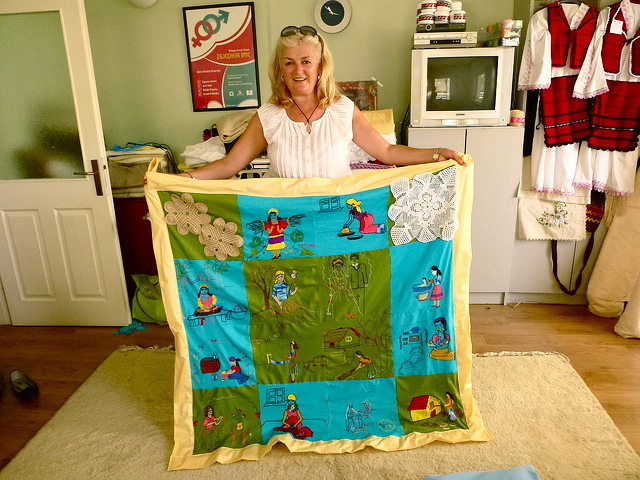 She hopes the quilting project will bring Kosovar Roma women together by showing off the beauty of their culture, but also illustrating their poverty. 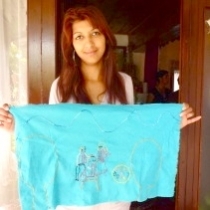 She hopes to help Roma women in Kosovo with her art. She believes that better education is key to stopping practices like young marriage and creating opportunities. Susana’s panel recalls her childhood. She imagined a mountain scene in which Roma, Albanian and Serb children play together. Susana remembers her own childhood as being very happy. She would spend days playing in the woods and in town, and it did not matter which social group her friends belonged to. Susana is a high school student in Gracanica. Mamudija, 46, is from Preotce. 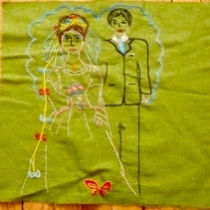 She loves to sew and was happy to contribute to this project. 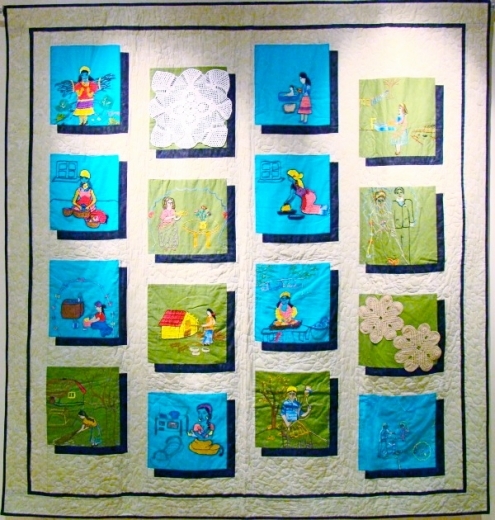 Her two quilt squares build on the overall theme of traditional Roma women’s domestic life. Her tile shows a Roma mother bathing her child. She is using the same water she used to wash dishes. In the past, Roma houses did not have bathrooms or hot running water. Because it was so labor-intensive to collect firewood and water, Roma mothers tried to conserve these valuable resources by making dishwater do double duty. Mamudija says that this practice still happens in some poor households. Esma, 43, is from the village of Preotce. 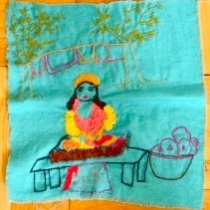 Her quilt square depicts a tender moment – a Roma mother in traditional clothes, breastfeeding her child. The wooden baby cradle is typical to the region. In the background is a stove heating food and bathing water. Family is extremely important in Roma society. 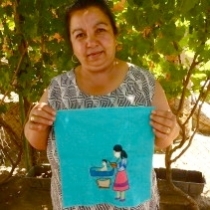 Esma loves makes handcrafts, including embroidered depictions of traditional Roma life, which she sells at craft fairs to help support her family of five. Kumrija worked with Mamudija on this panel, which shows a Roma woman baking bread in a large outdoor oven. She has collected the firewood. Such sights were once common outside Roma houses, and baking remains an essential skill for Roma wives and mothers. Kumrija lives in the village of Preotce.